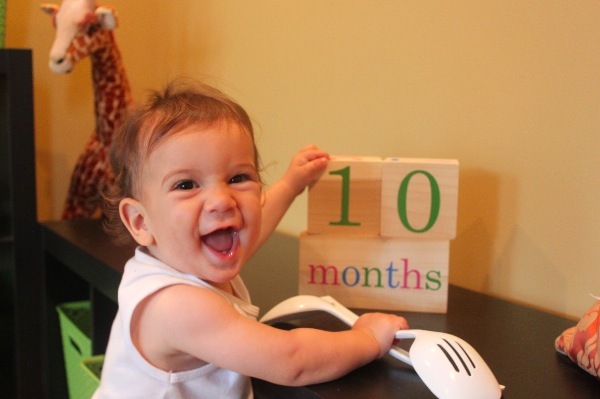 The weeks are flying, and Raffi’s first birthday is right around the corner. At 10 months old not that much has changed from the 9 month update. 1. 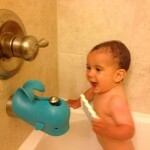 One day I decided to teach Raffi how to clack two kitchen utensils together. Instead of clacking them he held both of them in one hand for 4 straight hours. He even ate his lunch with one hand while holding them in the other. It was so funny. 2. 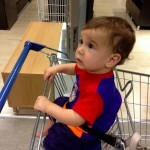 I love watching Raffi be independent. I put his straw water cup down on his mat and let him drink water when he’s thirsty. He will randomly crawl over to it to take a few sips. 3. While climbing the stairs one day he dragged a box up the entire way. Instead of taking one minute it took more than 20. He kept stopping to practice opening and closing the cardboard box. One time the box slipped down a few steps, and you could see his brain working as he figured out if he could safely make it down the steps to retrieve it. He ended up leaving the box behind, changing his mind, and diving for me so I could help him. So smart. 4. Raffi can’t wait for his dad to get home at night, and the minute he hears the door lock he starts squeaking and flapping his arms. If Trig doesn’t pick him up the minute he walks in the door Raffi is fuming. In fact, he INSISTS on being acknowledged and won’t stop squeaking and flapping until he gets his hug. 5. 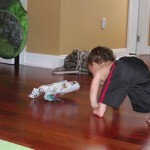 My son now crawls with his legs completely straight – in a downward dog position. He can fly so fast like that, but it looks like a lot of work to me. It’s funny. 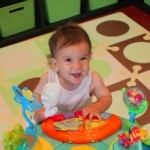 Raffi is adorable! I love reading about all the fun stuff he is doing. Any tips on how to get my baby to crawl? He is 9 months. @Maya, Thanks! I was kind of cruel and would put toys just out of Raffi’s reach so he had to figure out how to get them. I wouldn’t help him until he got cranky about it. I do think, though, that they all just do things at different times. 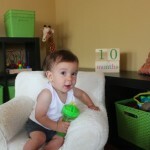 Raffi has no words yet. 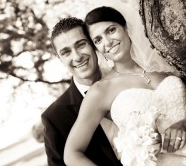 Raffi looks so happy! I would love to see a pic of his little flapping/angry self when Trig comes home and Raffi demands to be noticed. Sounds like he’s becoming quite the little character. 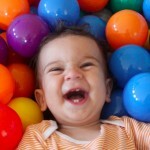 I love seeing babies’ minds develop. I love your updates! 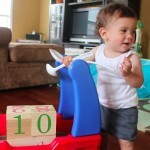 I can totally picture Raffi going up the stairs with the box. 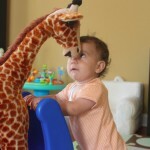 My daughter is just 2 weeks younger than Raffi and she did the same thing, except with a giant stuffed dog. 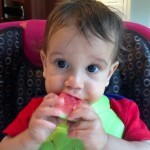 When he eats blueberries or anything like that (e.g., peas), do you cut them in half? Or does he eat them as is? Is he still nursing a lot or drinking a lot of milk? 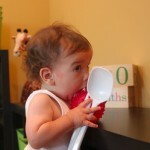 Or is he more into solids now? Your Raffi and my Sam are little twins! 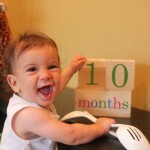 Sam is always crawling/cruising with something in his hands — plastic rings, straws, wooden spoons. And he loves the downward dog position. Also, he is thrilled when Daddy gets home from work. Love this age! Ahahaha love the downward dog crawling position! I feel like I haven’t gotten a Raffi update in so long! He is getting so big and his smile is heartwarming! I completely agree that this age is pretty amazing. I love watching H turn into a person. 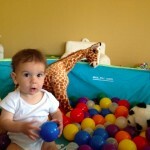 PS- LOVE the picture of R in the balls!